In 1940, a structure was built at Praça do Império, the site of that year's Exhibition of the Portuguese World, to serve as the restaurant for a celebration of the country's formation. Subsequent renovations had muddied its modernist style. DC.AD and Victor Vicente returned to the building, dubbed Espelho de Água, to restore and transform it into a lively dining room and art gallery. Inside, a large planting feature designed by Michael Hellgreen of Vertical Garden Design clads the kitchen block. "The idea behind the vertical garden was to bring a natural element to the space, since the overall look was very minimal," architect Duarte Caldas says. 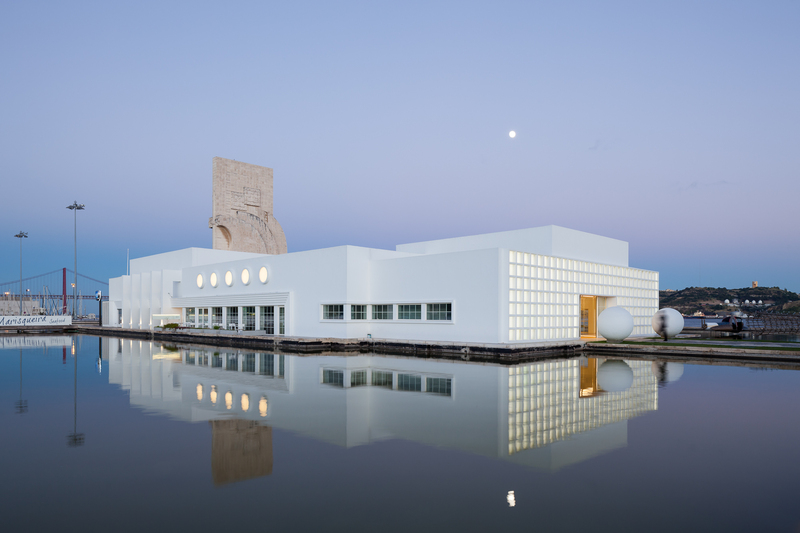 "The intervention was an exercise of looking back to the original project in order to restore as much as possible of the structure," Caldas says. "Besides removing internal walls and exterior add-ons, we closed and re-opened the framework in order to preserve the facade’s original proportions."